March 26, 2019 Update ... Here is the projected 2019-20 roster as we know it today. Good stuff as always, Traveler! If our juniors and seniors develop as expected, 2019-20 could be a very good year. Some might say our point guard will be a freshman. But Da’Vion Harmon is mature beyond his years mentally and physically. I’m not the least bit concerned about his ability to lead our offense. Oh, and he can also play defense. Thanks Ada. I am most interested in watching the development and improvement in our current roster players. I was spoiled by how Buddy and Isaiah demonstrated improvement season after season. I hope to see some significant improvement in several of our guys this coming season, and next. There should be a ton of room for Harmon and Bieniemy to drive with Reaves and Manek out there to stretch the defense. The new incoming recruit for the 2019 Class has been added to the roster above. What do you guys think of Victor? Always good to have an athletic big. I’m really hoping Harmon can step in and play. Did you mean to say an athletic big with a high motor and a junkyard dog approach to the game? I love this kid! He’s the kind of big i was hoping we would sign. I was tired of seeing bigs like Victor on every team OU played the last two years. That’s great to hear. I wasn’t sure on his play other than his recruiting video honestly. He'd start this year if he was on campus. Will be the starter from Day 1! Really hoping Doolittle gets back on track. He looked like a future stud after his freshman year. I know the semester off hurt, but he looked a lot worse than I thought he would. I agree. He’s shown flashes for sure. Number 4 2019 recruiting class per 247Sports. Lon does it the right way too I think. What do you guys think of this kid? 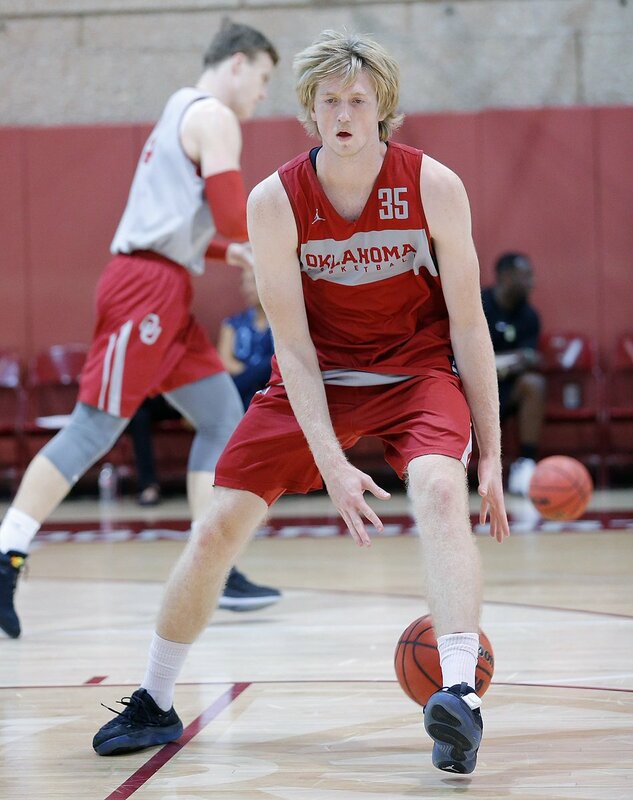 9/25/2018 UPDATE: The 4th recruit to commit to OU in the 2019 recruiting class is a JUCO center named Corbin Merritt. He is added to the roster as an incoming redshirt sophomore. 247Sports lists him as 6-9; 252 pounds. Manek needs to be a little more consistent on the road where it's always a tough place to compete. Doolittle looked disjointed/awkward on the floor last season. Needs to play more in the flow of things and stop second guessing himself and allow his athletic ability to come to the forefront. Manek? There is no Manek ... only Bird. Birdy Manek. Looks like he’s starting to tone up a little. Assuming no one transfers (a big assumption), OU is looking at 7 juniors and seniors on the 2019-20 roster; plus some very talented youngsters. That 20-21 year could be special. not complaining but down to 12th...I'm sure as other schools get their guys it'll drop a tad more. Glad for they way they are playing this year, but dang...we'll be replacing 4 "starters" and one of the 1st guys off the bench...or 3 starters and 2 off the bench. Might be a tough run next year. Tough? You mean fun hopefully. We can be just as good next year as this year. Williams, grad transfer, freeman, Kur, polla, also think Jalen Hill can play right away.